I rapped the glass with my beak…to no affect besides sending a ringing sensation somewhere behind my eyes. 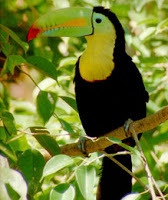 I have to tell you, from the viewpoint of a toucan—or rather, my viewpoint—these beak things are ridiculous and useless. I mean, look: who was the wise guy who took a look at the first toucan being made and thought, “Gee, let’s stick a fluorescent banana on that guy’s head and just see what he can do with it”? Needless to say, it wasn’t getting any attention from that freckled kid with the ice cream cone. It was like he was the one stuck inside a cage all day, lickin’ that cone like it was the highlight of his life. Have you ever seen the hippos? He could have given them a run for the most-boring-animal award…I mean, both of them; lick and chew, lick and chew, with that same vacant expression glued to their faces like the fake jungle poster stuck to the walls in here. My creative glass tap routine wasn’t going to snap mannequin man from his zombie state. So I decided to try something. A little trick I call “Berzerko-bird-with-his-head-in-the-water-bowl”. You see, it’s like this: you stick your head—or, in my case this Mardi Gras prop of a beak—in the water bowl, and then you shake it like someone’s slipped espresso pills in the seed tray. Water goes everywhere; the other birds think you’re getting beat up by the business end of an alligator or somethin’ and so they start freakin’ out—and soon the whole cage looks like Ginger Rogers in a blender: feathers everywhere. OK, so maybe it is a little bit like something the orangutans do in their crib, but I like to think we’ve made an improvement on their show. Anyway, I do my thing; it’s raining feathers, and still the kid keeps staring at the blasted turtle exhibit as if they’re actually doing something! Here I am, sucking water through my nostrils, and this kid can’t tear his eyes away from a creature whose greatest skill is being mistaken for a rock. If you’ve ever given a rock concert at a nursing home, you’d know how I felt, the other birds lookin’ at me and me giving them the “what’s-your-problem” look back. The birds don’t ask any questions though; I guess having a foot-long rainbow-colored club permanently in my possession has one good point.